After Rachel and some other friends completed the Cherry Blossom 10 Miler, a group of us headed over to Acadiana for their Mardi Gras Brunch. 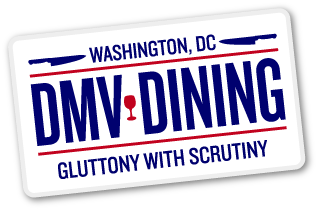 We were trying to find a brunch in DC that met certain criteria: a) it was prix-fixe, b) had something for everyone, c) was well-received, and most importantly, d) had either unlimited or highly discounted libations. Acadiana met each and every one of these prerequisites. We have been craving New Orleans cuisine since our trip to the Big Easy last November, so we were literally counting down the days until brunch. I myself shied away from any food before our 1pm reservation just knowing that we would most likely be stuffed once we finished. 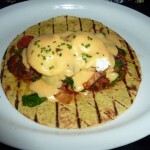 Acadiana features a three-course brunch for $29. For $9 more, diners have access to the raw bar where they can feast upon unlimited shrimp and oysters. The kicker, of course, were the dollar Bloody Marys and blood orange Mimosas. Yes, you read that right. Each cocktail during brunch is only one dollar! Once we were seated, the table received a few baskets of freshly baked buttermilk biscuits served with a side of red pepper jelly. After one bite, I knew we were in for a great meal. It was the quintessential biscuit: flaky on the outside, soft in the inside, and still warm when it reached the table. 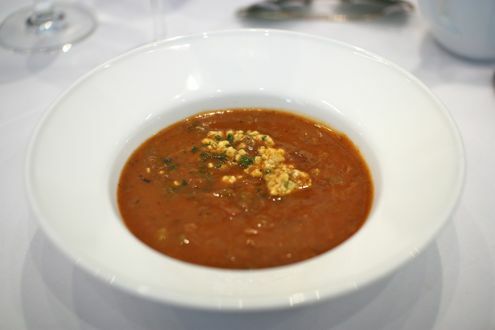 For the first course, I went with the turtle soup. Having eaten this for the first time at Commander’s Palace and fallen in love with it, I could not pass up another opportunity to try it again. 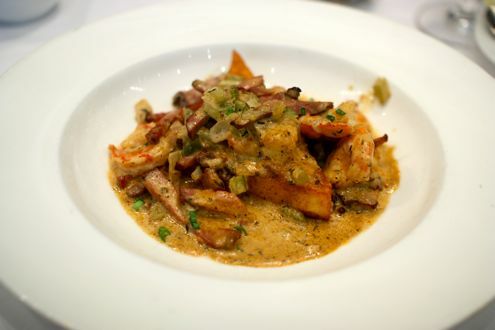 Acadiana’s version had a thicker consistency than that of Commander’s as well as a significant amount of turtle meat. In comparison, Commander’s Palace was more of a bisque and featured a subtle combination of turtle and pork. Overall, I preferred the version I had in New Orleans over Acadiana’s, but don’t let that discourage from you ordering it as it was still very good. 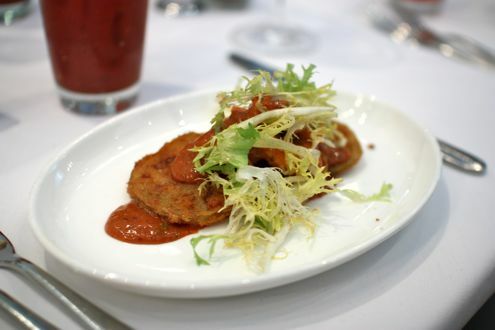 Rachel went with an old favorite – fried green tomatoes, topped with Zatarain’s spice boiled gulf shrimp rémoulade. When eating southern food, you can’t go wrong with that dish. Her only issue was that while each component may have worked separately, as a whole it was too much as the sauce overpowered everything else. The shrimp was a nice touch, but in the end, the fried tomatoes were left a little soggy. After sipping on a few mimosas (and some of Rachel’s Bloody Mary), I ordered the southern shrimp and grits for my entrée. They were simply outstanding. I have had shrimp and grits before (notably in Charleston), and while it wasn’t prepared in a traditional style last Sunday, these were still the best. I’m not sure if it was the delicately-prepared cheddar cheese grit cake, Tasso ham, or the rich sauce poured on top, but I cannot recommend this dish enough. Just wonderfully executed. 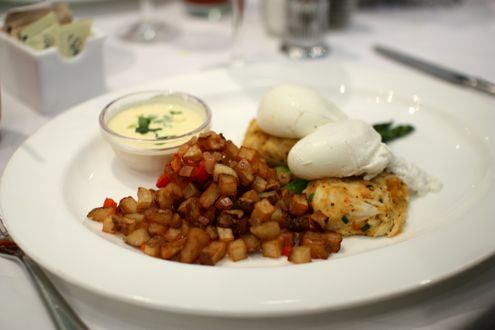 Rachel ordered what appeared to be their specialty, the Eggs Acadiana, which consisted of two poached eggs, Louisiana crawfish crab cakes, and Tasso ham hollandaise. She got the hollandaise on the side, and it came with a side of diced potatoes. She could have done without the potatoes because they didn’t add much to the dish, but the crawfish cakes were delicious with all meat, no filler, and a perfect blend of spices. 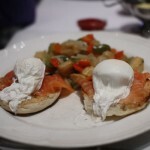 It wasn’t a wowing dish, but it was a great spin on the regional Chesapeake Benedict. As if it could not get any better, it did. I ordered the pecan tart for dessert and it was absurdly delicious. I’m dead serious: if you ever go to Acadiana, you have to order this. Describing it as rich would be an understatement. 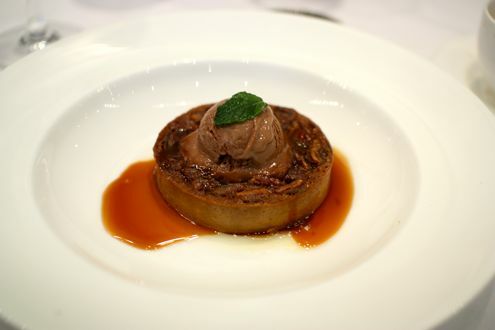 While the chocolate ice cream scooped on top might be a tad overboard, the bourbon and caramel glazed on top made every bite worthwhile. Rachel was torn between the traditional beignets with chicory coffee crème anglaise or going a little lighter with the sorbet trio. At first she ordered the beignets, but that was before the first two courses. 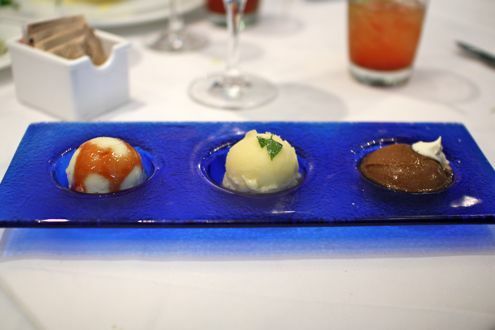 Halfway through the entree, she switched out her dessert to the sorbet, which featured caramel apple, pineapple, and Abita root beer flavors. Having been to the Abita Brewery and trying their root beer, I can attest that its like likeness was uncanny. Each scoop was incredibly refreshing and was a great way to conclude the meal. To top things off, the server dropped off turtle pecan fudge bites with the bill. We could barely eat the small morsels given how extraordinary full we were, but the whole table managed to try one and left Acadiana that much fuller. Overall, Acadiana served up an outstanding brunch. The food was delectable, the service was exceptional, and the price was just right given the portions as well as the highly popular dollar mimosas. Throw in the live jazz that was being performed throughout the day and you have yourselves quite the experience. Well done, Acadiana. 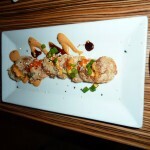 Acadiana is located at 901 New York Ave NW in the Chinatown neighborhood of Washington, DC.